I understand why everyone wants to eat healthier in January. You just get sick of ALL THE FOOD, all the time. It isn’t just about resolutions, it’s about feeling good on the inside too. A great way to start is by eating something healthy each and every single day. Replacing what you would normally have, with a healthy option. I made this commitment when I started eating better a few years ago. Instead of quesadillas, I chose burrito bowls. Instead of fries, I chose fruit. Instead of sugary lattes, I chose almond milk lattes with a touch of cinnamon. The list goes on and on, but you get my point. I ADORE having this blog, because I’m able to bring millions of people recipes that are simple, healthy, creative and FLAVORFUL. 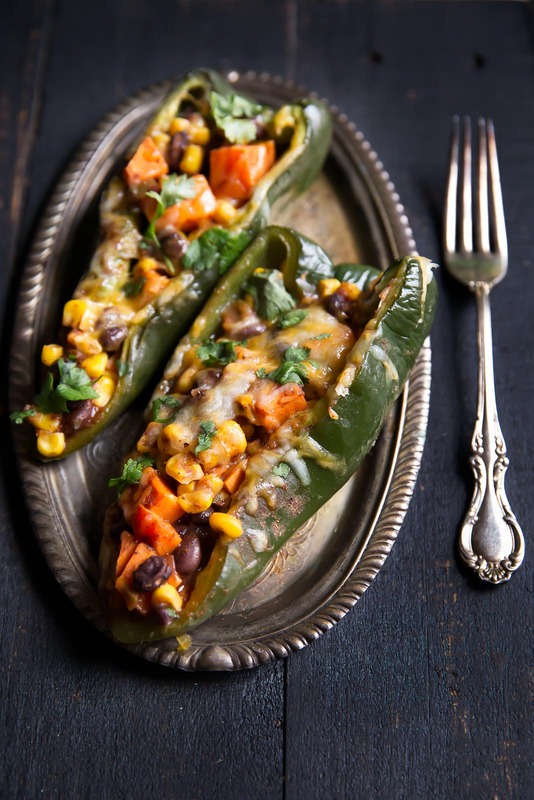 Of course, that includes these gorgeous vegetarian stuffed poblano peppers. The idea for these came after I made Tony and I regular stuffed peppers for dinner. I’ve been making those for years, and while always delicious, I wanted to try making a version with the unique, amazing flavors of poblano peppers. And SUCCESS! 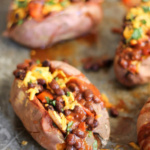 These include some of my favorite nutritious ingredients like sweet potatoes, black beans and corn, but also provide a good amount of fiber and protein. My favorite part about these peppers is how simple and effortless the ingredients and prep is; you probably have most of the ingredients already in your pantry. 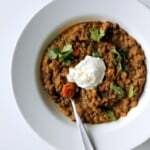 Another way to keep them lactose free or dairy free is by using Go Veggie’s lactose free shreds, which I did with this recipe. They’re versatile and melt beautifully. They just redid their packaging too! Here’s a photo of what the branding now looks like so that you can be on the lookout! Best way to serve these stuffed poblano peppers: Enjoy 2 poblano pepper halves on top of a serving of quinoa or brown rice for a complete meal. Top with avocado and extra salsa. ENJOY! XOXO. 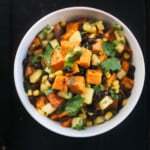 Add black beans, corn, onion, sweet potato, tomato salsa, chili powder, cumin and oregano. Divide evenly into each poblano pepper half. Cover pan with foil and bake for 40 minutes or until peppers are fork tender. Remove foil, sprinkle cheese on each pepper (about 1 1/2 tablespoons on each) and bake for another 5 minutes. Remove from oven and sprinkle with cilantro. Serve with guacamole and extra salsa, if desired. Makes 10 poblano halves. 1 serving = 2 poblano halves. If you can't find poblano peppers, feel free to substitute large red or green bell peppers. I recommend using 4 bell peppers and cutting them in half lengthwise. I recommend serving these on a bed of quinoa or brown rice for a complete meal. 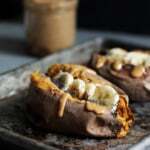 Recipe was slightly updated as I was getting some comments that the sweet potatoes weren’t cooking all the way through! This post is brought to you by Go Veggie! All thoughts & opinions are my own. Thanks for continuing to support AK and the brands that help make this site possible. 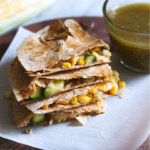 Follow Monique Volz | Ambitious Kitchen’s board Vegetarian Eats on Pinterest. 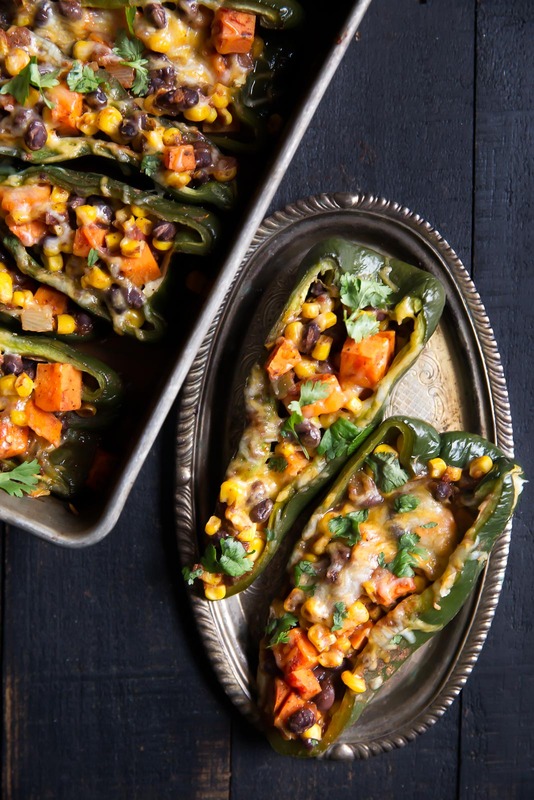 61 Responses to "Stuffed Poblano Peppers with Black Bean, Corn & Sweet Potato"
These look amazing and I’ve already added the ingredients to my grocery list for this week. One question about the nutritionals: it says a serving is two pepper halves but it also says there are ten servings which would be just one half. Just curious – always trying to watch what I eat! Thanks. Hi Camille! Sorry for the confusion! There are 10 poblano halves total and the nutrition info indicates that one serving size = 2 poblano halves. Therefore there are 5 total servings. Hope this makes sense! These sound amazing! 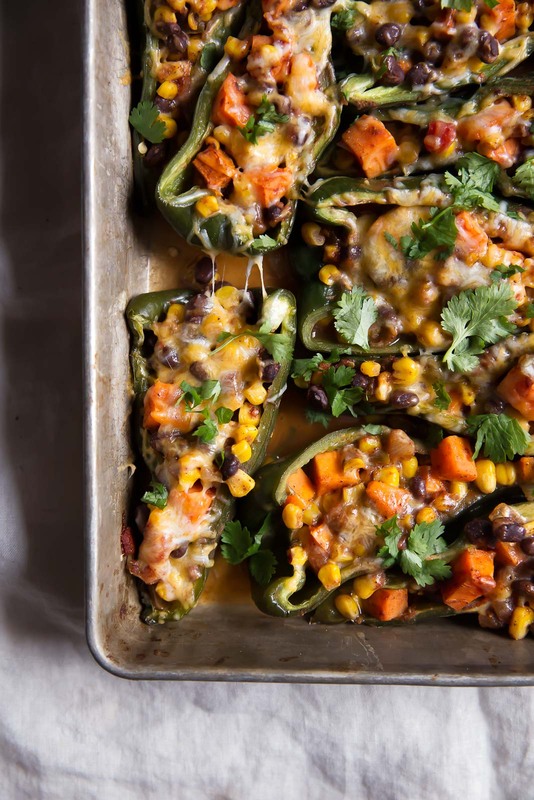 I love stuffing poblano peppers with tons of goodness! A staple in my house, too! I love the idea of using poblanos for extra flavor. these sound amazing! normally i buy the ones from trader joe’s, but these sound so much healthier (not to mention tastier!). I barely even ate all the goodies this season and I’m STILL looking forward to all the healthy January things…like these amazing looking peppers!! These are incredible! I’ve never tried poblano peppers, but I definitely need to! 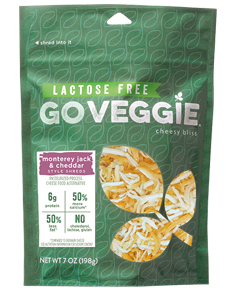 I really want to try Go Veggie’s vegan cheese soon. Thanks, Monique! I made these last night and found the sweet potatoes needed to cook quite a bit longer than the time indicated (I cut them pretty small and they were still crunchy). and the peppers were so spicy we were not able to eat them….which surprised me since we are usually pretty spicy eaters. Are they normally so spicy? (The peppers at my grocery were labeled Pasilla – some info I found said these are the same pepper…but maybe not.??) Other than that the flavors were good. I’d make again but have to modify a bit so it’s less peppers/less spice. That’s why they were so hot. If you buy frozen peppers I guess they have to be seedless if not make sure you wash them and take all seeds off. 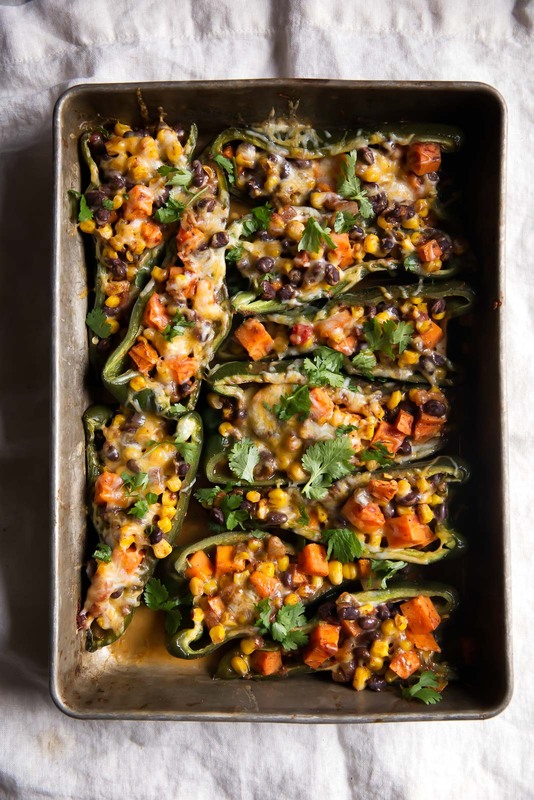 Poblano peppers are my favorite and I know my family would love these! Made tonight as written – delish! Happy to hear that Karen!! I agree with Nina that the sweet potatoes definitely need to be cooked more. Maybe microwave or saute them a bit first? Other than that it was good. I actually used red, green, and poblano peppers for a bit of variety. Also topped with some plain nonfat Greek yogurt before eating. I made these tonight with zucchini instead of sweet potatoes. I have worked with poblano peppers before. They are usually mild, but these were so hot they physically burned my fingers and face! It was a pretty traumatic experience. Going to try again with bell peppers. That’s so odd. Poblano peppers are a mild pepper, so I’m wondering if they were placed in the wrong section at your grocery store? Hmmm. These look INCREDIBLE! I love stuffed peppers and these look like they’ll have a bit of heat in them. Can’t wait to try it on Sat. night! As usual, you gotta weed through a lot of pointless “these look amazing” comments to get to the the couple of comments that actually point out a shortcoming of the recipe. Anyone who has ever cooked a sweet potato or roasted vegetables will instantly see the time and temperature specified for the bake and scratch their head. No matter how small you cut the sweet potatoes, they’re not going to cook enough inside a stuffed pepper half to be edible in 45 minutes at 350 degrees. 350 degrees is the temperature you bake cakes and cook roasts at, not the temperature at which you should be roasting vegetables. My wife prepared this last night, and at 350 degrees, even after an hour and a half, the sweet potatoes were hard and unpalatable. Not inedible, but they could have spent another hour in the 350 degree oven and still not been cooked correctly. Even with a convection oven, I find it hard to imagine that the results pictured on this page were achieved in 45 minutes at 350 degrees. I haven’t had a chance to try a higher temperature, but if we make these again, we’ll try 400 or even 425 degrees instead of 350 (in our conventional oven). A delicious recipe, spoiled by what are either untested or incorrectly specified time and temperature directions. I’m reading this as mine sit in the oven, which I just turned up to 400 degrees, because after 45 minutes, my sweet potatoes are rock hard. Seeing your comment at least reminds me that I am not alone. Evidently you didnt pay attention when she instructed you to microwave first! I didn’t have aby problem with the cook time, mine were perfect. Pay attention! So your saying it takes 2 and a half hours to cook a potato in your oven? Sounds like a problem on your end not in the recipe. As you said anyone who has ever cooked a potato would know how long it takes then you should have already known and taken that into consideration if you didn’t plan on cooking your potato in the microwave first like the recipe clearly states. I always cook my potatoes in the microwave and that is plenty enough time to cook them partway before the oven. I made this recipe tonight and had no problem cooking two medium=sized, pierced, sweet potatoes (not orange yams) in the microwave for 5.5 minutes to steam them both to perfection. I have a new microwave that cooks more evenly than any I’ve ever had. I refrigerated one sweet potato for breakfast tomorrow. It’s good to put them in a bowl with a few tablespoons of water and cover with plastic wrap to steam. I cooked the onion in a skillet coated in avocado oil and added frozen corn, black-eyed peas (what I had), and a few minutes later the spices and sweet potato cubes. I didn’t use an oven for anything. I always use a camp propane cylinder stove to roast the poblanos, then tossed them into a plastic bag and folded it over (to retain heat). When all pepper halves were scortched, I put the bag full into the microwave for 1 minute to enable the skins to slide off. I scraped the remaining skins with a sharp knife to remove them and rinsed in cool water. I shook the water off, placed pepper halves on serving plates and added filling. I topped each half with grated hot pepper cheese, microwaved 1.5 minutes and served with home-made salsa, light sour cream, and lime juice. My husband and I both thought it was delicious! Healthy? 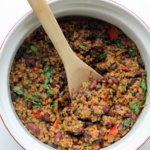 A dairy and meatless recipe with canned beans, canned corn and a store bought tomato sauce? Where’s the healthy part? Did I miss it? I made this last night. It was WONDERFUL. I sauteed up some small diced sweet potato with fresh corn from two ears and then followed the recipe as directed. I used mex blend shredded cheese and it was very very very good. I will make these again. I had thought about adding some shredded chicken to them, but it honestly didn’t need it. This is a hearty dish without meat. I liked the filling so much that I might use it in burritos. Thanks for the great recipe. Sheila in Salem Oregon. This was a great recipe idea. Really tasty. I used Trader Joe’s Roasted Corn. For spice, I used chili powder, cumin and just a sprinkle (probably 1/4 tsp) of cinnamon. I had regular cheese and put some sour cream on top, and my kids ate it and loved (always a plus!) Thank you! And your photo is delectable– it’s what “sold me” on making it. This sounds delish!!!!! A tip for impatient potato roasters…………..Poke a fork in the sweet potato and microwave on high for 4 mins 🙂 cool, peel & dice………continue with recipe ! I made this recipe last night for dinner. Amazing!!!! I could not find poblano peppers so I purchased an assortment of red and green peppers instead. I added fresh cheese, and a side of sour cream and avocado (and yes, I did microwave my sweet potato for four minutes as the recipe indicated). I grew poblano pepper in my garden from seed so had lots on hand. I microwaved a medium sweet potato for 4 minutes as directed and it was cooked through. I roasted an ear of corn for 10 minutes on the grill with husk in place. Otherwise, I followed the recipe as directed. We thoroughly enjoyed this healthy meal–we actually had it for breakfast with some adding egg to the top! Thank you for your tasty recipe. How well do you think this recipe would freeze? It is just me, so five servings is a lot. Hi Lissa! I think these should freeze okay, but the texture might change a bit. You could halve the recipe to have for the week! I don’t know if you are getting your “large poblanos” from the Chernobyl site, but there is no way on this green earth that all of that stuffing is going to fit into the large poblanos I have. Sure this is colorful and tasty, but save yourself the trouble and make this recipe into one of those trendy “bowl” concepts. I hope you enjoyed this one, Lisa! Sneaking in veggies in delicious recipes is the best 🙂 We’re working on a fix for our print button, but for now you can actually click the white space underneath the “prep time, cook time” box and a printable tab will open up! I’m using this as a jumping off point for tonight’s supper. I plan to precook both the onion and the sweet potato. I do not like raw onion, and I don’t have a microwave, so I’m planning to chop the sweet po and cook it with the onion kind of like a hash before mixing in the other ingredients. Also, I hate tomatoes, so I’m planning to use a tomatillo salsa. Do you think that will work? Yep those swaps should work! The onion also does cook when you bake everything. Enjoy! We had these a couple of weeks ago as our first meal of Meatless March. We loved them, and I took them to work and shared with friends, and they loved them, too! My spice-sensitive co-worker thought these were phenomenal, and my pesca-tarian friend asked for the recipe. I topped them with diced avocado, and they were a hit with everyone who tried them! Even though we’re not continuing as full-time vegetarians, we are going to continue trying to limit our meat in-take, and these will definitely stay in the rotation! Thanks for the great recipe! 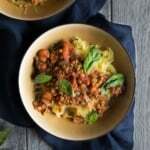 These were our favorite new recipe during our Meatless March! Amazing!! Love the idea of Meatless March. I’m so glad you guys enjoyed these!